Written by courtney rogin on Thursday, September 13th, 2012 at 10:00am. There must be some sort of a curse associated with shows that are ridiculously inexpensive — or at the very least, the cheapness of a show must be proportional to the likelihood of mishaps. So between this theory (call it Courtney’s rule) and the fact that the most recent 91x Next Big Thing showcase took place on Labor Day eve, it wasn’t unexpected that things would go a little awry. Here’s how it worked out at The Griffin on September 2: the first opener didn’t show up, the second opener wasn’t very good, and Aussie headliners Atlas Genius played a truncated set. 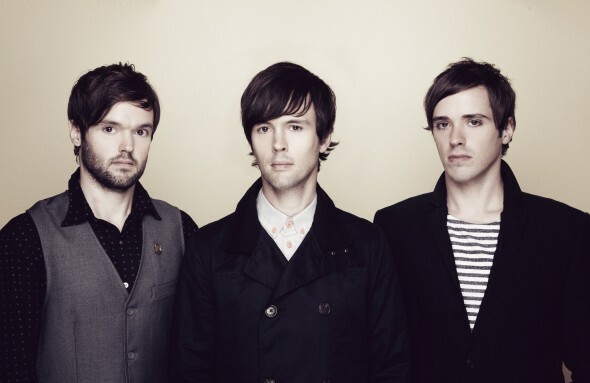 Atlas Genius itself is a quartet which features the three Jeffery brothers — Keith, Steven, and Michael — on drums, bass, vocals and guitar, respectively, and Darren Sell on keys. The band’s debut EP, Through the Glass (Warner Brothers), hit shelves back in June and their single, “Trojans,” has received plenty of alt-rock radio airplay locally and nationally. The night started off harmlessly, the first opener dropping off last minute, leaving one supporting band: L.A.’s Torches. Claimed a “band on the rise” by The Deli magazine, there is wonder if the band that performed at The Griffin was the same one that The Deli plugged. Either the genre-blending band tries to incorporate too many styles into their music, on their magical genre blender was on the fritz. Not one single song seemed essential — their set was more like a mix of background music.